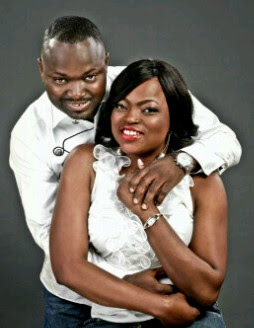 Messy details emerge on Funke Akindele's Marriage Breakup..
Well its all been in the news that Nollywood Actress Funke Akindele's marriage to Kehinde Oloyede Almoroof is over after her went on FB to publicly say so..
Well details have now emerged of what actually may have Caused the centre not to hold anymore..
See report by E247 Magazine below.. The marriage which suffered many hiccups shortly before it became known to the public, continually overwhelmed The Return of Jenifa star due to shocking and disturbing tales of extra-marital relationships that have led to not less than10 love children traced to Kehinde. The spate at which the estranged hubby's sexcapades played out nearly turned the hitherto adored actress to an object of ridicule and the topic of rile discussion among professional colleagues and fans. It worsens with caustic and cynical comments online. According to close family sources, the kitchen became too hot shortly after the marriage, as issues that did not surface prior to the wedding kept rearing their ugly heads and left unresolved. Kehinde, showed no remorse though after much pressure and damning reports in E24-7 Magazine, he admitted one of his mistresses, Modinat, and then three months pregnant for him was actually carrying his baby. Earlier, the media was awash with the shocking revelation that his second wife at home, Fadeke, was equally pregnant. Fadeke was forced to travel out during the wedding to Dubai, an indication that she did not support the union. In a typical Yoruba setting, the senior wife should receive the new bride into the family. Checks revealed Fadeke too was not formally received by the evicted first wife, Toun. All these and more drew public odium to the hitherto much loved The Return of Jenifa star, especially women who believed she’s a home wrecker. Though her world nearly crashed, Funke gathered the bits and pieces of her life, shunned critics, naysayers and had the wedding with all the trappings of a celebrity. Like a blind lover, she was rushed into the marriage. Even when it was obvious there was a crack in the marriage, she debunked all the reports: “ ‘My husband has never been married. I am the woman he got married to. I was married properly. A lot of negative comments came from sadists who want to run their mouths. So because I am a Youth Ambassador or a Celebrity, I can’t have my life? “‘It is my life. If I do things because people want me to, I will end up unhappy. I do what I do because I want to be happy. I would still continue to teach morals and campaign against HIV/AIDS and enlighten the youths. It doesn’t make me bad; that is even if it is, because I can tell you authoritatively that my husband is not married to anyone else. “‘Yes, he has beautiful children, who are not mine now and we have a cordial relationship, which dates back to even before we got married. “‘So what if he has kids? Is that a disease? That is where my heart is! I had many non-biological children even before I got married. I take them as my own children, pay their bills and help them. I have always loved children. So now that God has given me these ones, what should I do? “Will people be happier if I had married someone who didn’t have children, seem so perfect, put on my make-up and fake smile on the red carpet and start weeping when I get home? And about my in-laws, they are very wonderful and supportive and my parents and siblings as well..
Funke Akindele, observers argued , must really be in love and with that claim the inquisitive media kept off her trail but it was only a matter of time. The secret cannot be kept away forever. As expected, Funke blinked first but she could not say it out. She knew it was over and ready to face it, not by defending herself but putting her struggles and triumphs behind her to face her career. They kept each other at measured distance and it worsened with the fact that elderly family members, influential personalities cannot intervene. Both are fiercely independent adults. Kehinde had been to Funke’s dad once and hardly call her mum. Time, they believed will heal all the wounds. Her mum, just like her siblings have become such an intricate part of keeping her strong. The mother has since moved to her Ikeja home to give her strength. More evident that there was a crack in the marriage is each time Funke stepped out on the red carpet, Kehinde never showed. He was never with her at any public function. She however found company in her immediate elder sister, Ayo Ola Mohammed and shut her doors at some professional colleagues to avoid gossips. “While the trouble was brewing silently sources claimed that Funke gave several breaks and chances. She would call him, begged him even when she was right but Kehinde just wanted to have his own way not minding the consequences or effect of his actions on her, her career and public perception. He cared less about her status, in fact, all those negative media never got to him. He's fiercely independent. Surprisingly, he returned to Modinat Dada, who gave him a baby boy last October while he married Funke in May. It was a slap on Funke's face. In the heat of this, she lost her pregnancy though reliable sources hinted she was glad it happened as it prepared her for the imminent exit. The fact that both of them lived separately also worsened the situation. While Funke can be traced to her Ikeja home, her hubby is a 'bed sharer'. He shuttles between three known women- Funke, Fadekemi, Modinat, and strangely too, other harem. Baffling too is the issue of complex and security. Kehinde, according to our source could not believe that Funke’s back-to- back endorsement comes so easy. He thinks those corporate guys who give those endorsements cannot really take their eyes off her. Severally, he checked her phone and queried some names and the relationship she has with her callers.” Observers believe the fact that the marriage is broken was hurting enough but the decision of Kehinde to announce it on Facebook was heartbreaking and nasty. Not a few have lampooned him for his action considered to be childish and immature. His post did not give room for reconciliation. It went public and viral as soon as it was posted. His “Facebook divorce", an observer said, confirmed the marriage has been through hell and he needed to pour his broken heart out to the world. At Funke’s home, mum is the word. Members of the family have resolved to keep mute, fold their arms and watch how events unfold. It is such an unhappy ending. Labels: Funke Akindele, Funke Akindele Marriage Breakup details, Funke Akindele reasons why her marriage fell apart.Fubke Akindele Marriage breakup Latest.